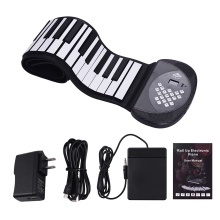 Portable roll up electronic piano with 61 non-toxic and waterproof silicon material keys, safe and comfortable to play, ideal for keyboard instrument beginners. Built-in stereo speaker, you can enjoy the music freely; also with 3.5mm audio jack for you to connect it with headphone or external speaker; supports connecting sustain pedal. With 128 tones, 128 rhythm and 15 demo songs, supports drum kit tone, metronome function, single finger chord and multi-finger chord mode, making your learn and practice easier and more interesting. Supports MIDI function, you can connect it with computer to make some edit and play piano games; also supports record and playback function, you can record your inspiration by pressing the REC button at anytime. The 3.5mm microphone jack allows you to connect a microphone to sing while playing the piano; built-in BT enables you to connect your smartphone to play some accompanying musics. Can be powered by the built-in 1200mA Li-ion battery or the included USB cable + power adapter, more flexible and more convenient to use.